Jenny’s Kindergarten & Early Learning Centres are really excited to announce that our new cutting edge Leichhardt Centre is now open. This landmark location provides premium education and care to 0-6 year olds between the hours of 7.00am to 6.00pm. This is a unique Centre where the old meets the new, whereby the whole original cottage has been retained and we extended at the rear with a state of the art building. There is natural play environments with existing vegetation and plants that have been retained as well as the combination and addition of new creative outdoor play space. Here at Jenny’s Kindergarten we believe in making the world a better place for the future. In order to make the world a better place Jenny’s Kindergarten have a number of measures in place to implement and encourage sustainability. Some of these measures include rainwater tanks to save water, solar energy to promote clean and renewable energy and led lighting to promote efficiency. Jenny’s Kindergarten have a large amount of natural play space to allow children to foster an appreciation of the natural environment. By implementing measures to promote sustainability we believe we can contribute in taking care of the air, water and land and those who live there. 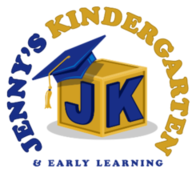 Jenny’s Kindergarten & Early Learning prides itself on providing high quality education and care to meet the needs of all our children and families by employing experienced and passionate educators.